I did NOT like this story that much -- even if it does talk of Snow now that the weather is hot, BUT found another translation also in Public Domain a bit better AND a puppet production that expands it in a more entertaining way. I know Hans Christian Andersen often wrote sad endings to his stories. I don't mind those endings, they often are needed and do tend to regret Disneyfication of those stories. The crucial problem is the audience needs a reason to identify with the story and its characters, even if we know it won't end well for them. Last week the issue of translation was mentioned and even included a bit of academic criticism of the 1872 translation by Mrs. Paull. I was delighted to find the livelier 20th century translation by Jean Hersholt apparently is available. This is based upon finding it online. If this is incorrect I'll have to insert the 19th century version here, but it's a perfect example of why it's important to check several translations to get the flavor of a story. My own copy's illustration isn't used since I'm uncertain if my 1948 illustrated edition of Hersholt's translations is still under copyright. 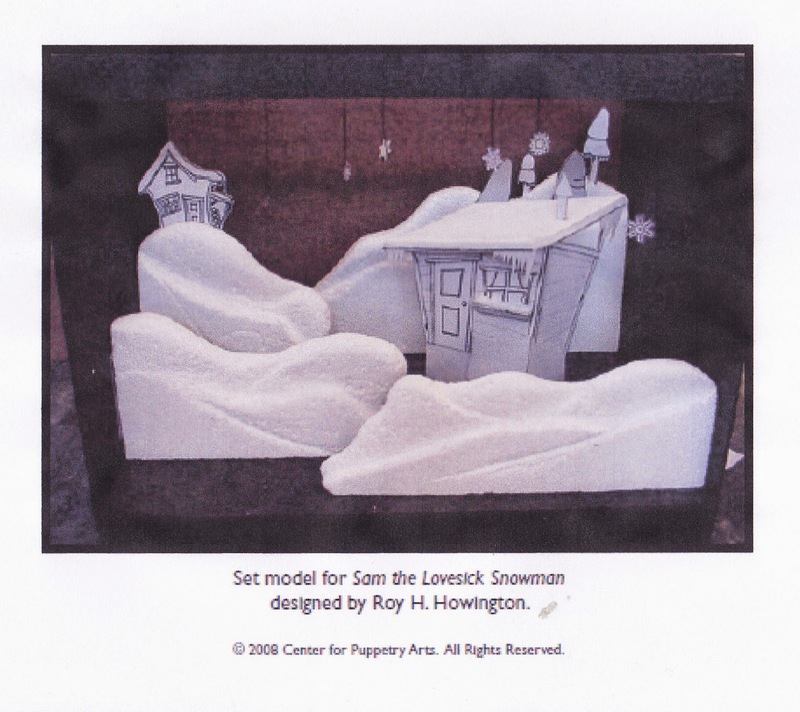 Instead I will insert a picture from the production of Stan the Lovesick Snowman based on "The Snow Man" by Andersen by Center for Puppetry Arts. 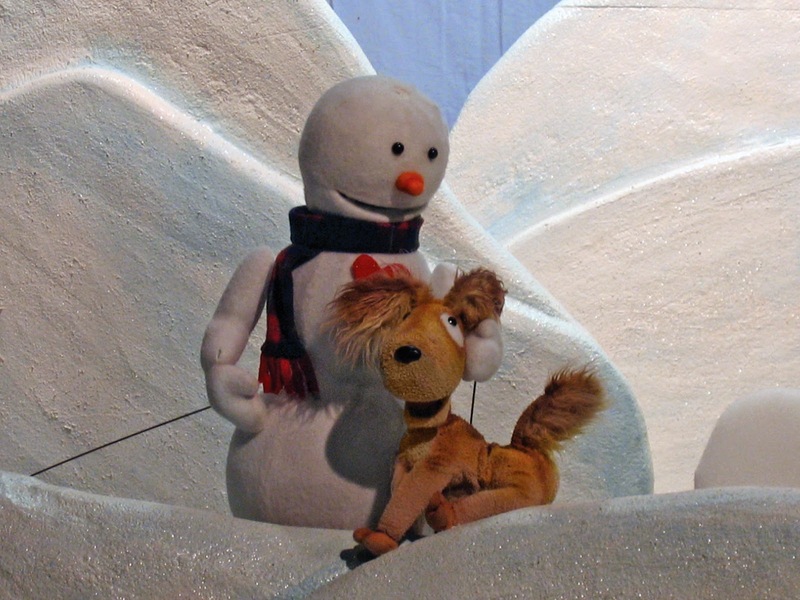 The website of Stan the Lovesick Snowman does an outstanding job of explaining why they fell in love with Andersen's original story because of the "wide-eyed innocence" of the newly made snowman and how the family dog takes it upon herself to "explain the world to him - albeit from a decidedly canine point of view. Their relationship is like a slightly older child interpreting the world to a younger child. It is Stan’s innocence that gets him into trouble when he falls in love with a wood stove. There is a lot of humor in this potentially disastrous infatuation. Everyone but Stan can see that the stove is too 'hot' for him." 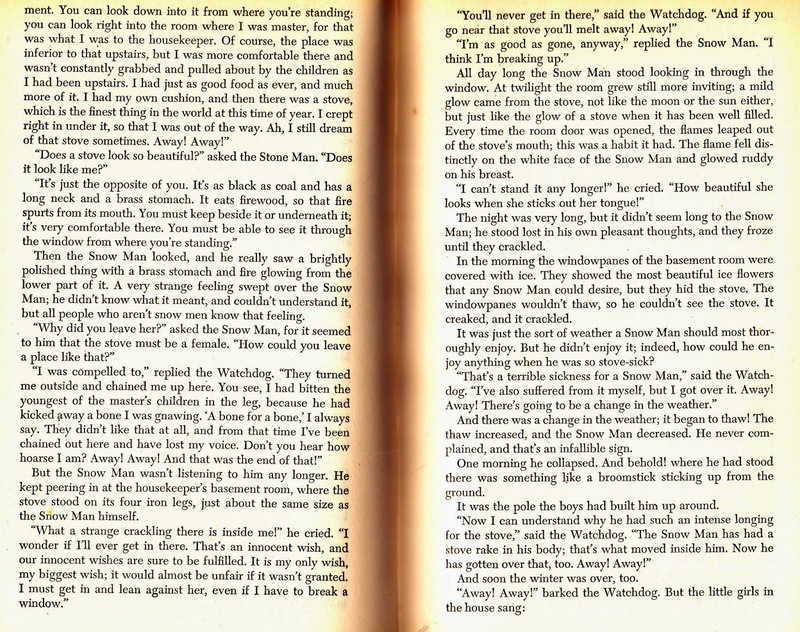 They also appreciated the wintry setting of the story, with its "dreamy snow-laden countryside complete with snowflakes, icicles, and cold starry nights without ever having to leave the relatively mild Georgia winter." CPA is in Georgia and developed the program back in 2008. This show is still in their repertory, but has gone through a few changes. You can still find their original study guide for teachers along with school performance standards from kindergarten through 6th grade. You will notice that originally Stan was called Sam. This was to avoid confusion with another "Sam the Snowman" in yet another show they offer. 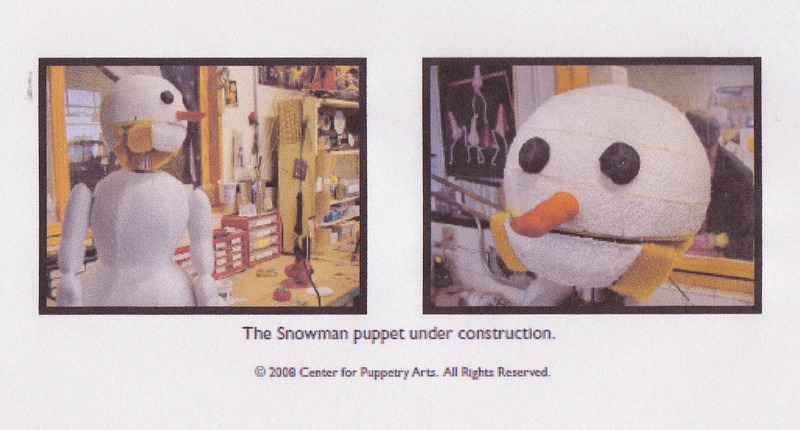 Be sure to also look further down on the web page of Stan the Lovesick Snowman for information on the style of puppetry. It gives a great explanation of this very professional use of rod puppetry, a puppetry form students can easily use in a simplified introduction to puppetry. There is a teacher's eye view of rod puppetry in the study guide. The CPA study guide includes biographical information on Andersen, including his own growing up producing puppet shows and a brief glimpse of some of the difficulties in his life. There's also one of Andersen's many elaborate paper cuttings. 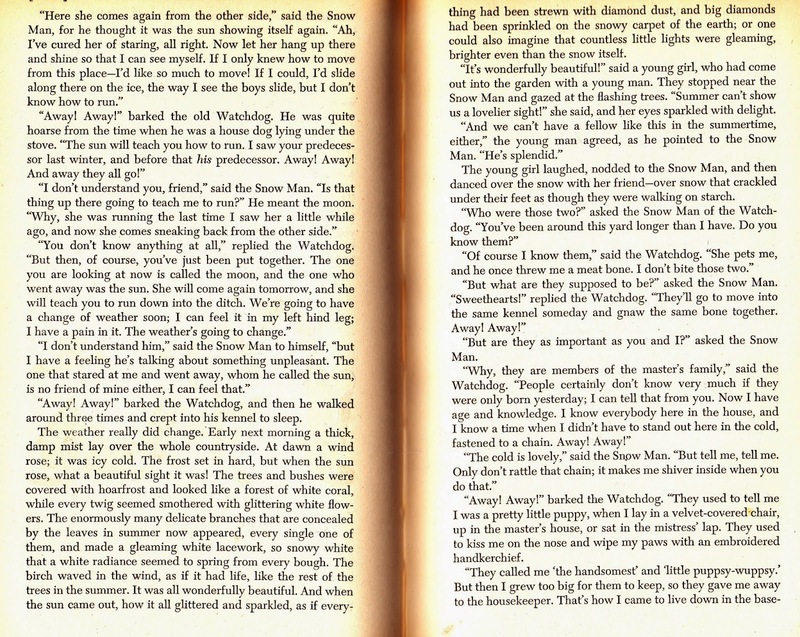 The one in the guide doesn't specifically accompany the story, but does mention how Andersen would cut while telling his stories to children, only to end by unfolding it and showing how it fit the story's theme. 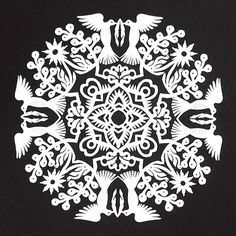 I don't know if he ever did one of this story, but such artistry certainly gives ordinary cut paper snowflakes quite a challenge! Of course the guide includes an explanation of how the CPA production uses rod and shadow puppets. 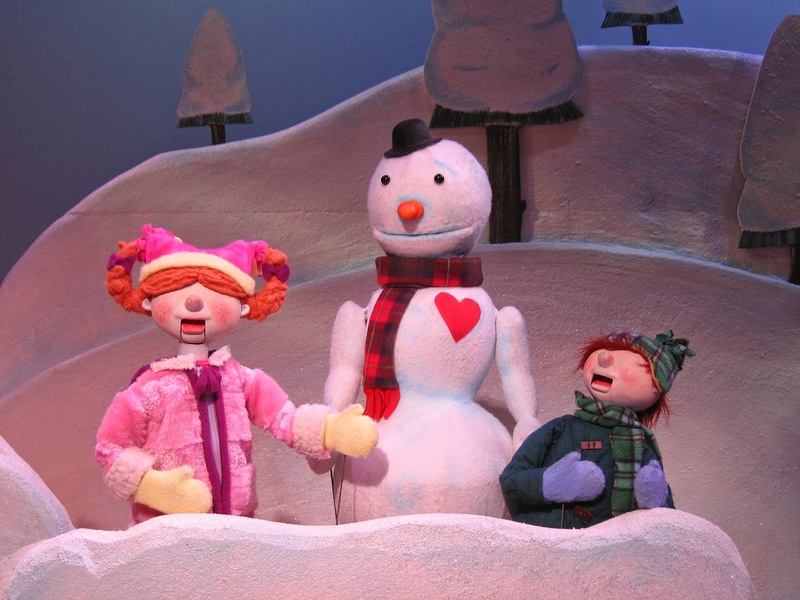 It also mentions their show was expanded by adding a young snowwoman interested in the Lovesick Snowman, even as he's falling in love with the stove to make a "hilarious and heartwarming story perfect for the holiday season!" There are hints that, just as in the Andersen tale, this "seems like a romance destined to fail." The guide's bibliography and internet listings cover a range of topics: Andersen, snow, snowflakes, snowmen, paper cutting, and more since it's intended to serve classes from kindergarten through sixth grade. Doesn't that leave you wanting to see how the Center for Puppetry Arts handled the story? 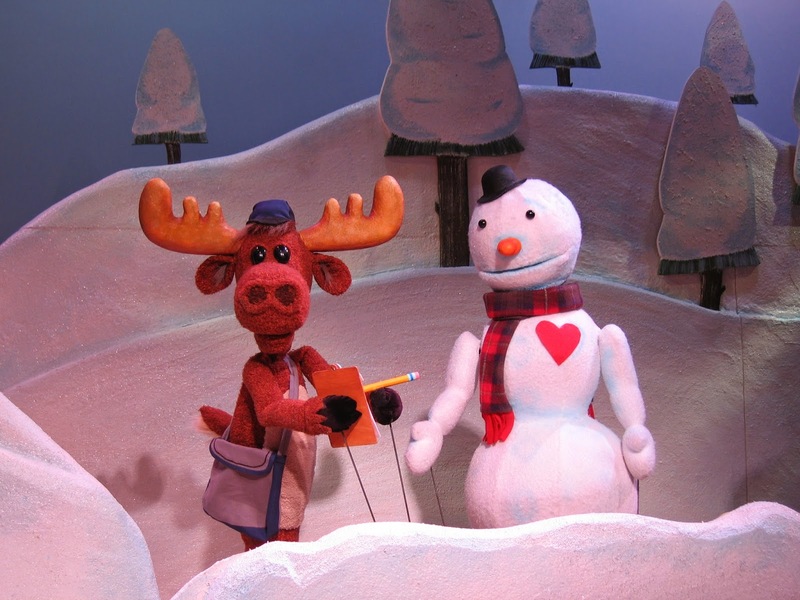 The guide gives us enough clues we can tell it ends with the Snow Man melting, but both their production and Hersholt's more modern translation show a story that shouldn't melt away...or at least we might have yet another look at it when winter returns. Based upon the way they caught the story's appealing innocence and, yes, even their appreciation for winter -- (BRRRRRRR! I'm enjoying its end right now here in Michigan!) -- I'm ready to revise my view of the story, it might even be a great way to counteract those rare Michigan days when it seems too hot. held at the Detroit Institute of Arts. The festival information -- as well as my own workshop which will give ideas for using puppets with storytelling, teaching, or other ways beyond the traditional puppet show -- can be found at "A-to-Z Puppets Are Easy" earlier this month. Next week I'll return with yet another posting that's puppet-related. Say that 10 times fast!